Soy yogurt provides calcium and live cultures without requiring the system to digest lactose or animal fat. Soy yogurt�s live cultures help strengthen your immune system, and its relatively high fiber content�2 grams of dietary fiber per serving� will help satisfy you and lower your cholesterol. Soy isoflavones may help increase insulin secretion and improve glycemic control. Researchers speculate that soy yogurt, especially when served with fruit, may help regulate the enzymes that affect blood sugar levels in persons with diabetes. Six ounces of flavored soy yogurt provides 170 calories, 32 g carbohydrate, 6 g protein, 3.5 g fat, 2 g dietary fiber, 25 mg sodium, 300 mg calcium, and 1.08 mg iron. Almond butter is a great, high-protein, high-energy alternative to peanut butter. Almonds provide significant protein, calcium, fiber, magnesium, folic acid, potassium, and vitamin E. Because almond butter is rich in monounsaturated fats but extremely low in saturated fats (and it has no trans fats at all), it is a heart-healthy choice. Almonds and almond butter are rich in plant sterols, which appear to have cholesterol- lowering benefits. One plant sterol, beta-sitosterol, appears to alleviate the symptoms of benign prostate hypertrophy�enlarged prostate�a condition that more than half of men over age 50 will experience. Two tablespoons of almond butter contains roughly 35 milligrams of beta-sitosterol. Two tablespoons of organic creamy roasted almond butter provides 195 calories, 6 g carbohydrate, 8 g protein, 17 g fat, 3 g dietary fiber, 100 mg calcium, and 1.08 mg iron. There are so many types of cheeses that it is hard to generalize about their content, let alone their health benefits. Cheeses can be made, for example, from cow�s milk, goat�s milk, sheep�s milk, or the milk of water buffalos. Since milk is produced as the sole food for calves, lambs, and kids, it is already rich in protein and calcium. Cheese-making is a process that further concentrates this food into a solid, and the result may well include significant amounts of phosphorus, zinc, vitamin A, riboflavin, and vitamin B12. Unfortunately for those trying to live a healthier lifestyle, cheese-making also tends to concentrate the fats in the milk. Low-fat cheeses are available�in general, cheeses that are not aged tend to be lower in fat. Fresh mozzarella, farmer�s, and chevre cheeses can be good choices, as well as harder cheeses that are specially made with low-fat milks. But cheese has so many milky Benefits that it may also be the right place to �spend� some extra calories. Its high protein, mineral, and fat contents mean that it is digested slowly, and it will keep you feeling satisfied for several hours. The high nutritional value of cheese and its beneficial roles in health make this food an important dairy food to include in a healthful diet. One ounce of fresh mozzarella, given here as an example cheese, provides 70 calories, 0 g carbohydrate, 6 g protein, 5 g fat, 0 g dietary fiber, and 50 mg sodium. 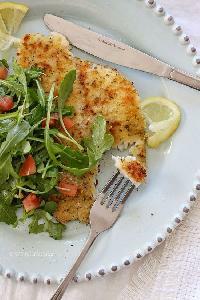 Boneless, skinless chicken breasts are the high-protein convenience food of many a diet. Four ounces of chicken breast meat provides two thirds of the recommended daily value for protein for the average adult. Chicken breasts are lower in fat than dark meat. With the skin removed, a chicken breast has less than half the fat of a chicken breast with the skin! Chicken is a very good source of niacin, a B vitamin that is involved in repairing DNA; vitamin B6, which is important in several metabolic processes; and selenium, a mineral that plays a role in thyroid metabolism and is also an antioxidant. Research suggests that selenium may help prevent cancer. (light meat) Three and one-half ounces of roasted chicken (light meat without skin) provides 173 calories, 0 g carbohydrate, 30.9 g protein, 4.5 g fat, 0 g dietary fiber, 85 mg cholesterol, 29 IU vitamin A, 12.4 mg niacin, 0.97 mg pantothenic acid, 4 mcg folic acid, 247 mg potassium, 77 mg sodium, 216 mg phosphorus, 15 mg calcium, 27 mg magnesium, 1.06 mg iron, and 1.23 mg zinc. (dark meat) Three and one-half ounces of roasted chicken (dark meat without skin) provides 205 calories, 0 g carbohydrate, 27.4 g protein, 9.7 g fat, 0 g dietary fiber, 93 mg cholesterol, 72 IU vitamin A, 6.5 mg niacin, 1.21 mg pantothenic acid, 8 mcg folic acid, 240 mg potassium, 93 mg sodium, 179 mg phosphorus, 15 mg calcium, 1.33 mg iron, 23 mg magnesium, and 2.80 mg zinc. Cod have been commercially fished and traded since at least Viking times. They were an important export of the New England colonies from the time Europeans began to settle there, so this Atlantic fish has long played a role in European and Mediterranean diets. Taxes and limitations on the export of cod were among the grievances that sparked the American Revolution. As a result of its long commercial history, the name �cod� has been applied to a number of fish, most of them white-fleshed and relatively light in taste. The name is now technically applied only to Atlantic cod, Pacific cod, and Greenland cod, related fishes that are in danger of overfishing, in part because their health Benefits have long been apparent. Cod are an excellent source of niacin, phosphorus, selenium, and vitamin B12, and they also provide significant magnesium, potassium, thiamine, and vitamin E.
A good source of omega-3 fatty acids�three ounces of cooked cod provides 0.1 gram�cod appear to greatly benefit the cardiovascular system, as they are linked to lower blood pressure. Cod liver oil was at one time recommended to provide vitamins A and D. It�s now believed that the health Benefits of the oil are probably related to the omega-3 fatty acids. Three ounces of Pacific cod cooked by dry heat provides 89 calories, 0 g carbohydrate, 19.5 g protein, 0.7 g fat, 0 g dietary fiber, 40 mg cholesterol, 27 IU vitamin A, 3 mg vitamin C, 2.1 mg niacin, 7 mcg folic acid, 440 mg potassium, 77 mg sodium, 190 mg phosphorus, 8 mg calcium, and 26 mg magnesium. Edamame are young, green soybeans in their pods, cooked by boiling, which make a great snack�high in fiber and protein, rich in calcium and potassium. Cooking the soybeans increases their available isoflavones, including daidzin, genistin, and genistein. Genistein has been investigated for its role in limiting the size and number of fat cells, possibly acting as an aid to preventing weight gain. Soy isoflavones may also reduce the risk of heart attack. A cup of soybeans provides more than half of the daily recommended value of protein for the average adult�in less than 300 calories. Soybeans do, however, contain a fair amount of fat�11.6 grams per cup, of which 2.2 grams are saturated fat. One-half cup of boiled green soybeans provides 127 calories, 9.9 g carbohydrate, 11.1 g protein, 5.8 g fat, 3.8 g dietary fiber, 140 IU vitamin A, 15 mg vitamin C, 100 mcg folic acid, 485 mg potassium, 13 mg sodium, 142 mg phosphorus, 131 mg calcium, 2.25 mg iron, and 54 mg magnesium. Eggs have long been known as a good, inexpensive source of animal protein. They lost favor for a time when the role of cholesterol in heart disease was first identified, because egg yolks do contain a fairly high concentration of cholesterol (though the whites are cholesterol-free). Research since that time has determined that an egg a day will not raise the risk of heart disease for most people. Those who already have high cholesterol may want to limit their intake of yolks to two a week. 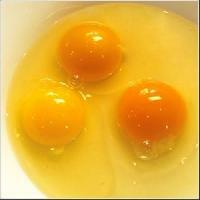 Egg yolks are an excellent source of choline and lutein. Choline, an antioxidant, may be involved in reducing levels of homocysteine, thereby helping reduce the risk of heart disease. Lutein, found in the retina, may help prevent macular degeneration; it also has antioxidant properties. Eggs are also a good source of vitamin B12 and folate. Hens fed a diet of flaxseed, which is itself high in omega-3 fatty acids, produce eggs that are also high in omega-3s. These eggs may have as much as seven times the omega-3 fatty acids of conventional eggs. They also contain more vitamin E.
One large whole egg provides 75 calories, 0.6 g carbohydrate, 6.2 g protein, 5 g fat, 0 g dietary fiber, 213 mg cholesterol, 318 IU vitamin A, 24 mcg folic acid, 61 mg potassium, 63 mg sodium, 89 mg phosphorus, 25 mg calcium, and 5 mg magnesium. 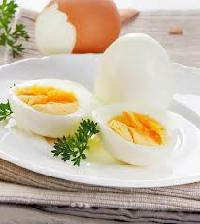 A cup of egg whites contains 26.5 grams of protein�about half what the average adult needs in a day. Separated from the yolk, it has almost no cholesterol, so egg whites can be used in place of eggs in many places, increasing the protein content without adding cholesterol. Egg whites have a very delicate taste and are much enhanced by the flavors of other foods, so they are especially good in vegetable omelets and baked goods. In addition to protein, egg whites provide potassium, calcium, magnesium, phosphorus, copper, zinc, iron, and B vitamins. Egg whites are somewhat high in sodium, however. The white of one large egg provides 17 calories, 0.3 g carbohydrate, 3.5 g protein, 0 g fat, 0 g dietary fiber, 47 mg potassium, 54 mg sodium, 4 mg phosphorus, 2 mg calcium, and 4 mg magnesium. Powdered egg whites add the protein and minerals of eggs to a wide variety of foods. One tablespoon of dried egg white powder provides 50 calories, 0 g carbohydrate, 12 g protein, 0 g fat, and 0 g dietary fiber.